Mai Shiranui (不知火) is the granddaughter of Hanzo Shiranui, master of Ninjitsu and Koppo-ken. Mai learned from her father the secrets of Ninjitsu, and became an expert in stealth and other sneaky tricks. She is deeply in love with Andy Bogard, though their relationship is unclear most of the times. When the new King of Fighters tournament was announced, it was decided that the fights would take place between teams of three persons each. Mai felt it was a sure bet to make a team with Andy Bogard, but he thought otherwise: he would team up with Terry and his friend, Joe Higashi. Mai was left out, but she promised Andy that she would be in the tournament as well. 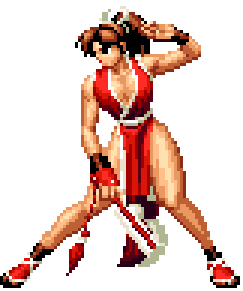 Once she found out that the Southtown bouncer King had received an invitation as well, and had no assembled team, Mai immediately proposed herself as a team member, along with her friend Yuri Sakazaki. King was not expecting this, but accepted them anyway. During the next two tournaments, the Gorgeous Team was seen as a beautiful, but deadly team. However, by KOF '96, Yuri was obliged to take her father's place in the Kyokugenryu Team, and King and Mai were left without a third team member. When Mai seemed hopeless, a strange woman attacked her. Mai avoided the attack and prepared to fight. The woman praised Mai's skills and introduced herself as Kasumi Todoh, the new third member of the team. Once more, the Gorgeous Team was back in action. But by next year, King and Mai were in trouble again, as Kasumi was still looking for her father. They resigned themselves to losing the tournament that year. King had to take care of her brother, Jan, anyway. However, Chizuru Kagura intervened, and told Mai and King that she would gladly be the third team member, and that she would take care that Jan would go with them. This page was last edited on 31 December 2012, at 06:03.